Oahu is an island of adventure: surfing big waves, diving colorful reefs, and hiking across towering ridges may come to mind first- but have you thought of visiting Hawaii to be adventurous with your food? Oahu’s culinary scene is like nowhere else, with roots in its Polynesian history combined with both Western and Eastern influences. I spent a week discovering the best restaurants and dining experiences on Oahu, including the 2018 Hawaii Food and Wine Festival, Sustainable Farm-to-Table Meals, and even Local Food Trucks. My culinary adventure began aboard Hawaiian Airline’s nonstop service from San Diego International Airport on the Airbus A330, where the amenities in the First Class cabin had me actually wishing the flight was longer! With lie-flat seats and seemingly endless entertainment options, every detail of the experience is made to feel personal and comfortable. Friendly faces of the flight attendants warmly greeted me and I instantly felt “Hawaii” as soon as I stepped foot onto the plane. Hawaiian Airlines First Class Cabins feature lie-flat seats worthy of an international flight. Meal Service menus are designed by featured chefs renown on the islands. Hawaiian Airlines chooses chefs to design a menu for the meal service in First Class, and I was lucky enough to be treated to Chef Lee Anne Wong’s watermelon and feta salad and a main course of slow roasted beef with vegetable couscous. The best thing about trying Chef Lee Anne Wong’s menu aboard our flight to Hawaii is that once on the island, we would be visiting her own restaurant as well as experience a private dinner prepared by her. More on this below. 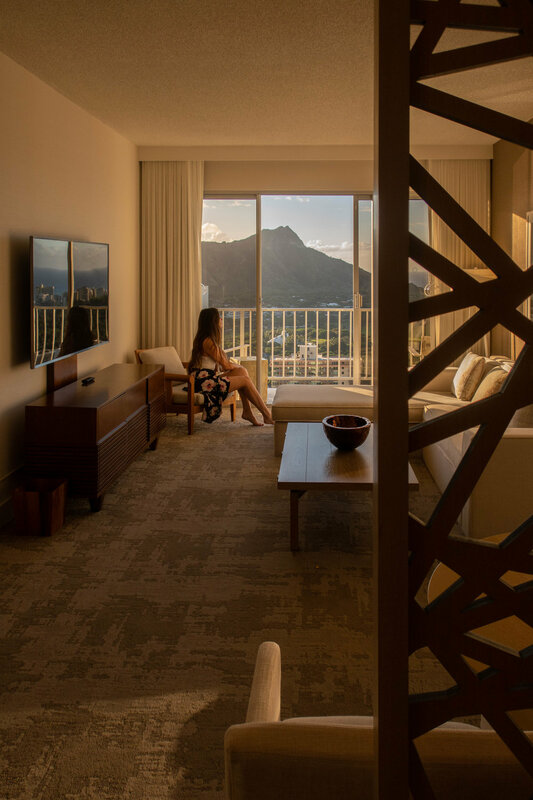 For a home base in Honolulu where you can feel like you’re in the middle of all the action at Waikiki Beach while still being treated to modern amenities and luxurious accommodations, the ‘Alohilani Resort is a newly opened 4.5-star hotel with unbelievable views of Diamond Head Crater and the expansive Pacific Ocean. Between the two restaurants by Chef Masahuru Morimoto and the poolside menu (order the fish tacos!!) at Swell Bar, you are sure to have plenty of options to indulge in without having to leave your home at ‘Alohilani. ‘Alohilani resort offers eastern facing views of diamond head crater. Shown here is the view from a suite on the 39th floor. But because there is so much to see on Oahu- I definitely recommend getting out there! The best way to see the island is definitely at your own pace, which is easy when renting a car with AVIS. Take in all of Hawaii’s beauty with panoramic views in a convertible or a soft-top Jeep (I recommend soft-top instead of hard-top so you can easily cover up if Mother Nature decides to shower!) as you explore beyond Honolulu into Oahu’s North Shore, Leeward Coast, and Windward Coast. Catch panoramic views of Oahu’s famous ridges in a convertible from avis car rentals. Three of my favorite stops along our Culinary Road Trip were Kākoʻo ʻŌiwi, Kualoa Ranch, and Mari’s Gardens, which were more than just meals- rather they were full experiences where we learned about the sustainable crops growing on the farm lands before tasting the unique flavor combinations profiled by some of Hawaii’s must highly-regarded award winning chefs. Using and educating the public about “canoe” crops that were brought over by the Polynesians first inhabiting the Hawaiian Islands is extremely important in promoting a sustainable future where Hawaii can rely less on importation and increase the production of goods that can be consumed locally. On Oahu’s Windward Side lies an area of wetlands where Kākoʻo ʻŌiwi, a non-profit organization encouraging education of agricultural programs and appreciation, invited us to learn hands-on about the cultivation and restoration of taro patches. The program promotes sustainability and multi-generational practices of cultivating the wetlands, and is open to visits from travelers, school programs, and locals alike. After getting knee deep in the taro fields to understand the amount of work that goes into farming, we were treated to a delicious lunch by Hawaiian Airlines Featured Chef Mark Noguchi on the very same fields where many of the ingredients were harvested. Among the courses were steamed kalo, ahi poke, slow cooked pork, and spicy ulu. Famous for being the film location for movies including Jurassic Park and Jumanji, Kualoa Ranch is also home to acres of diverse “canoe” crops, oyster farms, and shrimp farms, among other various products for harvesting. An experience that was just recently made available to any guests visiting the Ranch, the Taste of Kualoa Farm Tour shows you around the property highlighting areas you wouldn’t normally see on other tours. During our visit, our experience ended with a seven-course lunch at Hale’Aina Lanai by Chef Kimo Kauhane, which included a papaya quinoa salad, taro ciabatta bruschetta, Kualoa raised tilapia, Kualoa grown oysters, Kualoa pond shrimp, Kualoa cattle ranch beef, and spiced ulu fritters. Seemingly known to passersby as a quaint nursery shop, a stroll through Mari’s Gardens shows visitors a large-scale operation of sustainable aquaculture and hydroponic farming systems that source their produce to grocery retailers, restaurant chains, and large markets on Oahu. The impressive garden center has become a source for farming education to many on the island, and is also home to an enchanting event space. Picture banquet-style seating at a long table that holds living vegetation as centerpieces and is made from a glass tank with water flowing through to support the tiny fish swimming underneath your dinner plate. Our dinner menu was designed and prepared by Chef Lee Anne Wong, with wine pairings by Sommelier Chuck Furuya. Among the many courses included salad bouquets, Kauai shrimp, Ni’ihau lamb meatballs, whole roasted fish, roasted pork belly, fried chicken, ulu gnocchi, and island fruit paired with macadamia nut crumble. The wine pairings added to the experience, with Chuck Furuya introducing us to flavors and profiles that refreshed and opened our palettes to enjoy the meal even more. lunch at Hale’Aina Lanai overlooking the shrimp farms and ridges of kualoa Ranch’s jurassic valley. Taking place over almost the entire month of October and spanning multiple islands, the Hawaii Food & Wine Festival is an unforgettable event where locals and travelers alike can indulge and experience tastings from chefs from all over the nation. Also a unique opportunity to see founders and chairmen like Chefs Roy Yamaguchi and Alan Wong, the Hawaii Food & Wine Festival is a celebration of yet another thing that make these islands in the Pacific even more special. Don’t fret if you missed out on this year’s celebrations, you can Save the Date for next year’s event: October 5-27, 2019.
tasting the best of hawaii’s food and wine at the hawaii convention center. hawaii food & wine festival 2018. As much as Hawaii’s economy depends on tourism, the emissions associated with travel can increase the size of your carbon footprint, leaving a mark on the environment. But did you know that you could plant a tree to offset the amount of carbon created by a family of four traveling from the mainland to Hawaii? The initiative of Gunstock Ranch’s Legacy Forest is supported by ‘Alohilani Resort, who has pledged to plant 100,000 native milo trees with the help of its guests. Thanks to RFID tracking, guests who plant trees will receive a dedication certificate and can track its growth as it becomes a part of a living and breathing forest. Once at Gunstock Ranch, guests can hike, go horseback riding, or drive off-road vehicles to one of many viewpoints to catch a glimpse of Oahu’s North Shore. When it came time to leave the island, I was reflecting on all memorable events I enjoyed and the delicious meals I had tasted but remembered that I needed to save room for one more- Hawaiian Airline’s First Class meal service on the return flight is designed by Chef Mark Noguchi, a familiar face who cooked our lunch during our visit to Kākoʻo ʻŌiwi. Even though I was completely full after exploring this side of Hawaii, the experience left me hungry for more, and eager to see what other off-the-beaten path discoveries I can search for. Regardless of what those discoveries may be, I know that Hawaiian Airlines and Avis can get me there safely and in style. This article was made possible by Hawaiian Airlines, Avis, ‘Alohilani Resort, and the Hawaii Food & Wine Festival.